Tall Vintage Coat & Hat Stand. Umbrella Stand & Drip Catcher. Exactly as described, arrived early and kept in touch all through the process. "Fab quality, fab service, highly recommend, many thanks, A". 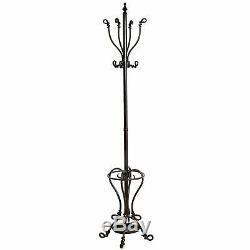 The item "Tall Antique Black Hallway Coat & Hat Stand Vintage Iron Hooks & Umbrella Holder" is in sale since Thursday, July 13, 2017. This item is in the category "Home, Furniture & DIY\Storage Solutions\Clothes Rails & Coat Stands". The seller is "chosenbyjessica" and is located in Colne. This item can be shipped to United Kingdom, Austria, Belgium, Bulgaria, Croatia, Cyprus, Czech republic, Denmark, Estonia, Finland, France, Germany, Greece, Hungary, Ireland, Italy, Latvia, Lithuania, Luxembourg, Malta, Netherlands, Poland, Portugal, Romania, Slovakia, Slovenia, Spain, Sweden, Australia, United States, Canada, Brazil, Japan, China, Israel, Hong Kong, Norway, Indonesia, Malaysia, Mexico, Singapore, South Korea, Switzerland, Taiwan, Thailand, Chile.